Yoga is back! Fridays at 5:30pm! Your new favorite yoga experience begins every Friday at 5:30! The cost is only $16, and includes a Bounce wristband which allows you to get in unlimited cardio (or play!) before or after yoga on our inflatables (including our inflatable sports arena). The massage chair is included, too! This mixed level yoga class guided by Zack Ferguson smoothly connects movement to breath with a strong focus on alignment - modifications are offered for intermediate to advanced practitioners. Listen within and deepen your connection to the wisdom of your body, while strengthening muscles, tendons, and joints, and relieving tensions of the body and mind. Although the class is limited to ages 14 and up, you're welcome to purchase a wristband to allow younger children with you to bounce, climb or zap while you unwind, de-stress and challenge your body. After you're done, you're welcome to play with them for as long as you both like! 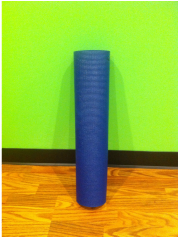 We have several yoga mats available to use, or you are welcome to bring your own. Your first class is free with any wristband purchase, too! We'll see you on Friday!